Why not show the world that you, too, want to believe! 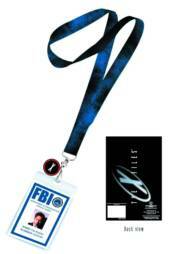 With this excellent officially licensed X-Files Lanyard. The perfect work or convention accessory for X-Files fans, these cool lanyards are ideal for holding onto ID cards or passes at work, college, and comicons! Choose from Mulder and Scully designs.